Experiment with different methods of blending colour in your sketchbook. Feel free to try any method of hatching, rubbing or smudging and layering. Look carefully at your experiments and make notes about the success and effects of the different methods. Coloured pencils can be very carefully controlled and are excellent for drawing detail. 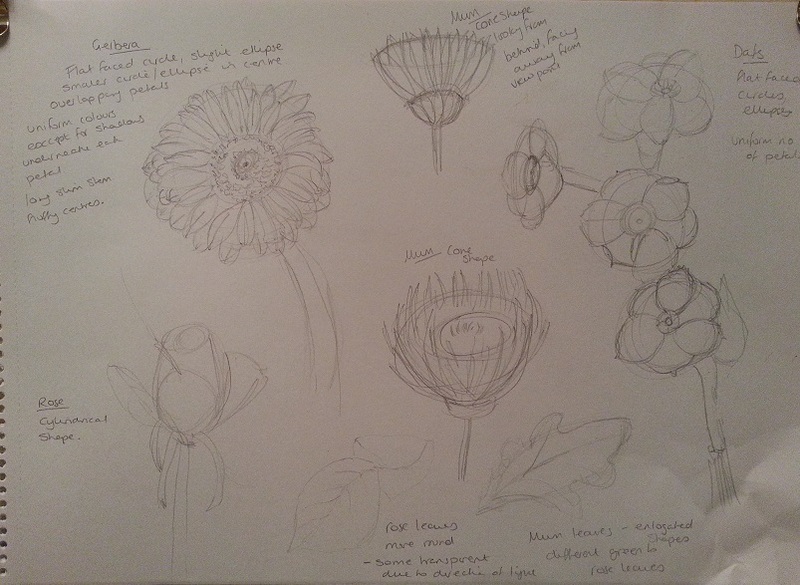 Making a drawing of plants and ­flowers will help you to explore the ways that coloured pencils can translate detail. 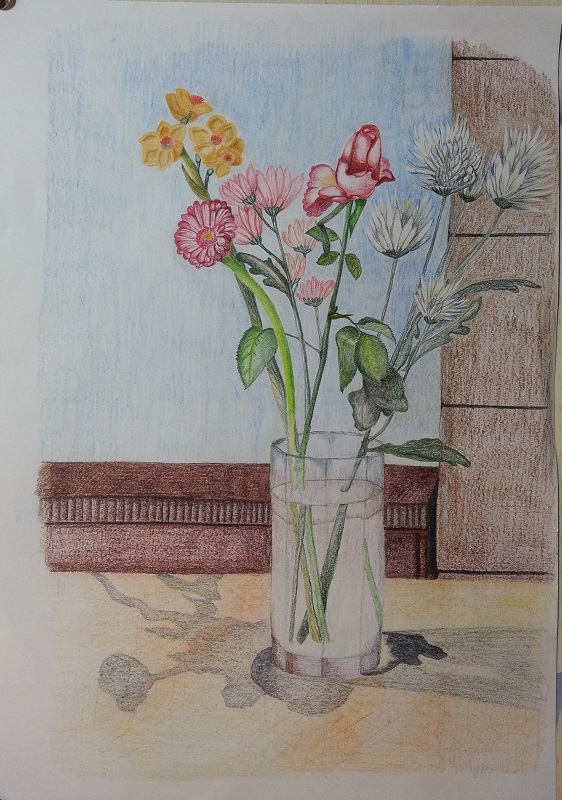 The flowers I chose for this exercise were chrysanthemums, gerbera, narcissus and a rose. 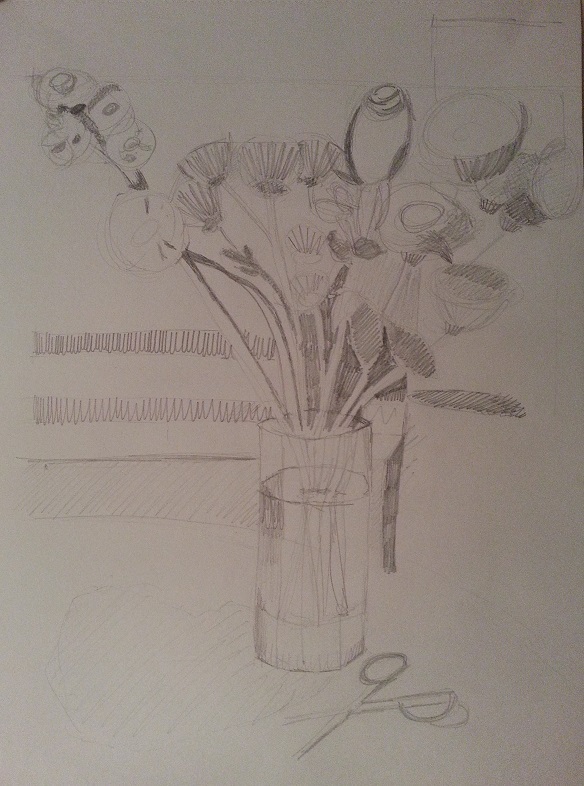 First I looked at the shapes of the flowers and drew basic shapes, circles, ellipses and cones, to get a feel for the shape of the flowers. I wanted to establish a shape before putting in detail. I had already experimented with using coloured pencils in the first exercise, which could be used for this exercise as well. I used inktense coloured pencils just as pencils without the addition of water. Second, using A3 cartridge paper, I did two compositional studies, one looking at tone. 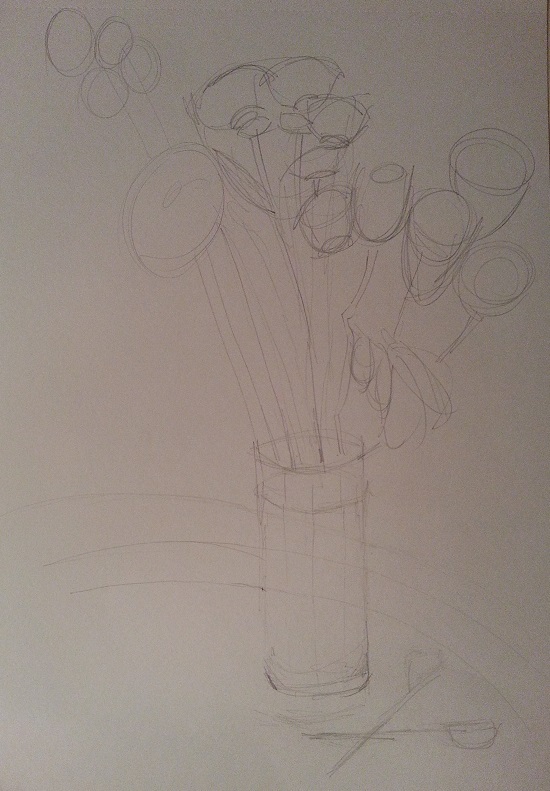 I quickly sketched the composition and decided that there were too many flowers in the vase. After removing some, I rearranged so I could see different planes and set up a pair of scissors which I associate with cut flowers. Light direction from right hand side. I looked for the tones of flowers that were in the shade and again struggled with finding light mid and dark values rather than colour. I drew in the main composition, including the back ground but left out the scissors. I used lots of layers to build up a colour that was representational of the flower. I looked hard at the shadows and how they changed the colours of the flowers. By layering I attempted to transition between colours. The flowers ended up being too flat, I lost some of the highlights and the flowers don’t really ‘pop’ from the background. There was a lot of reflected colours in the glass vase which I haven’t successfully shown. This was a very interesting exercise to do using this medium, as it has shown me how not to use coloured pencils as well as showing how I could do it better. I think I could spend a long time just layering and layering to create a lovely depth. I don’t think I’ve shown a good light source direction, it’s not really apparent where the light source is coming from. It looks confusing. I should have made thumbnail sketches to work out possible issues before embarking on the final drawing.